The Norsk Romsenter (Norwegian Space Centre) signed a contract in January 2018 with UTIAS (University of Toronto, Institute for Aerospace Studies) for the construction of the NORSAT 3 microsatellite. The Space Flight Laboratory (SFL) is developing NorSat-3, a 15-kilogram microsatellite, for the Norwegian Space Centre. NorSat-3 follows from the highly successful NorSat-1 and NorSat-2 satellites also built by SFL. Both satellites were launched in 2017 and are currently operational. 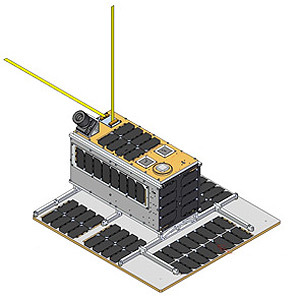 NorSat-3 will carry an experimental navigation radar detector to augment ship detection capabilities from its Automatic Identification System (AIS) receiver. NorSat-3 will add another satellite to Norway’s assets in space – four in total so far, all producing data related to maritime traffic monitoring. Combining a navigation radar detector and AIS receiver will potentially provide much better maritime awareness for the Norwegian Coastal Administration, Armed Forces and other maritime authorities. The satellite is funded by the Norwegian Coastal Administration and managed by the Norwegian Space Centre. The Norwegian Defence Research Establishment (FFI) is leading the development of the radar detector payload which is funded by Norway’s Ministry of Defence. NorSat-3 is a civilian satellite that will detect only the signals at frequencies that the International Maritime Organization has allocated for civil navigational radars. Automatic Identification System (AIS) message reception alone may not provide a complete picture of maritime traffic. The problem of missing or manipulated AIS messages can only be addressed through the use of supplemental sensing technology. In the case of NorSat-3, a navigation radar detector provides some supplemental support for more accurate ship detection and identification. Detections of navigation radar from ships will provide the ability to verify the accuracy of received AIS messages and also the ability to detect ships whose AIS messages have not been received. NORSAT 3 - 20xx with ?